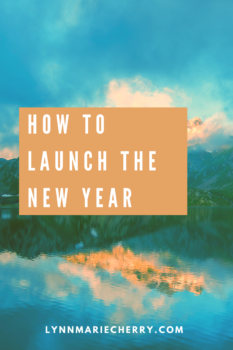 If you turn the calendar over into a new year with laissez faire, I think this blog will provide a gentle nudge that you’ll thank me for later. If you are the geeky goal setting type…hang in there and know that I have some cool links to share that could be right up your alley. I haven’t had the best perspective on New Year’s resolutions, goals or anything else in that category. Goals felt way too much like expectations and from my experience, expectations lead to disappointment. So for a long time, I flat refused to set goals, all in an effort to shield my heart from the slow drip of disappointment. I felt like God was challenging my self-protective goal avoidance. And I appreciated that it didn’t sound like a three-step, fail-proof formula. It felt like God was saying that desire in itself brings about good. The risky act of dreaming would enrich my life whether or not the dream came true. So in recent years, I have taken time between Christmas and December 31st to focus on launching the next year with hopeful desire. I found two wonderful tools online. Jennie Allen’s Dream Guide leads me to reflect on the previous year and be intentional about the next in four key areas: Spiritual, Relational, Personal and Work. With these handy tools, I begin the new year with focus and optimism. If you have a resolve for good, a work of faith or a desire for this new year, PRAY. Invite the power of God to work alongside, through, over and above your desire. Invite his grace to strengthen your resolve on the days when your desire is fading. and may you experience the good that comes even when your desire is not fulfilled.